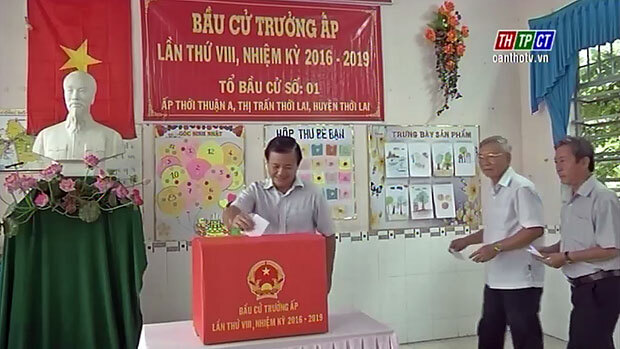 In Thới Lai district, Mr. Đào Anh Dũng – Vice Chairman of Cần Thơ city People’s Committee and voters in Thới Thuận A hamlet attended the opening ceremony for the election for heads of areas, hamlets. Mr. Đào Anh Dũng implements his citizen’s rights. At 7 am, 108 electoral groups and 112 polling stations in Thới Lai district opened for the election. Thanks for good propaganda and careful preparation for the polling stations, after the opening ceremony, representatives of households fully implemented their citizen’s rights. The election took place safely and successfully./.